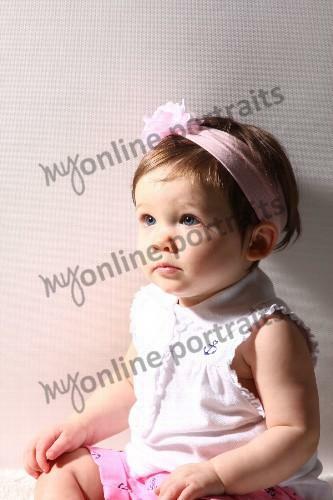 Portrait done by Picture me studios in Walmart of Emma Kay during her Summer photos. We had Lilly's done at school in May..sadly I don't have a working scanner right now or else I would be showing off both my babies right now. We plan to take them both back for family photos and photos together next month. Emmie's last pictures. All done by picture me studios in Walmart. Did you know that you can now pick any pose for your package? I haven't been since they started doing this! Em just would not smile for anything in the world..lol. She always has this serious look. 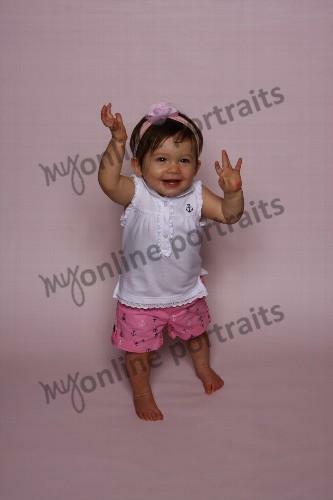 We were getting ready to end the session when we placed her on the floor and off she went walking and smiling. Did I mention she can walk now? The photographer was so nice and asked could she re-do all the photos! That is service and cheaper than Olan Mills. This picture screamed Emma and was my choice for the package. Frugal Family fun...I bought these ceramics in little kits a Michael's. It came with the ceramic, paint, and brush for .49! What's even better? Save the pain/brush and your next visit you can buy just various ceramics to paint for .29. The girls had a absolute blast painting. Although Emmie was a little more interested in taste tasting the paint. I found this cool set of dishes by Kelcraft..designed by Noritake..for 6.00 at the thrift store! Lowe's build and grow workshop. Lilly now has three badges and very proud! Cost...FREE! Daddy and Lilly Rose with their finished product. 4th of July cake. Total cost...with ingrediants..was under 3.00. The girls playing in the pool. Btw, got this pool on sale last year by Fisher price. It was normally 54.00 and I got it for 3.00 for Em's first Christmas...talk about a steal!!!! Even came with a whale sprinkler that moves around the pool. We found someone had been living in our grill..lol. This is what we found when we moved it out of storage. We think it was left over from spring. There was no eggs or babies...so we just moved it to some high grass. Very amazing to look at. The girls swimming. This was Em's first time in the pool. Yes I am Angel..lol. She wants to be a builder when she grows up. Doots is all about getting messy and playing rough. Barry said all girls are fine with him..he says he feels like he is getting the son experience with her sometimes..lol. This year she wanted a Bob the builder lunch box. I explained she'd be the only little girl with one and she was cool with that:) Angel how is your Mom?